That's all from Anfield, Liverpool have comprehensively beaten Red Star Belgrade and are back in contention in Group C. Plenty to talk (and type) about in the coming days on VAVEL UK, make sure that you check out all of our post-match analysis pieces. Thanks once again for your company and hope to join you again soon. Rounds of applause all around Anfield and deservedly so. Liverpool made light work of the Serbian opponents who played in the right manner but could not get close to Alisson's goal. What was most pleasing about Liverpool's performance was the sharpness of movement and thought that the attackers showed. They played with more tempo and verve, it was too much for Stojkovic and his fellow defenders at times, albeit they did show an element of resilience even if the scoreline does not necessarily show it. The whistle goes everyone rises and that's that. A comfortable and convincing win for Liverpool by four goals. Mane finds himself in space just inside the area following a delicate touch from Firmino but Mane hits his shot into the side netting. This game has long been won, but still Red Star attack, time is running out for them to get a consolation goal. The fourth official has indicated that there will be three minutes of stoppage time to be played. A sense of deja vu as Sturridge takes aim from far out in the final minutes with a curling shot. Borjan dives to tip the shot wide of the post for a corner kick. The main question on everyone's lips is: Will there be a fifth? Less than two minutes (plus added time) to find out. Moreno's first involvement is a good one. He applies a lovely-weighted back-heel to a neat Liverpool move on the left. Moreno receives the ball back but the attack breaks down due to an offside. 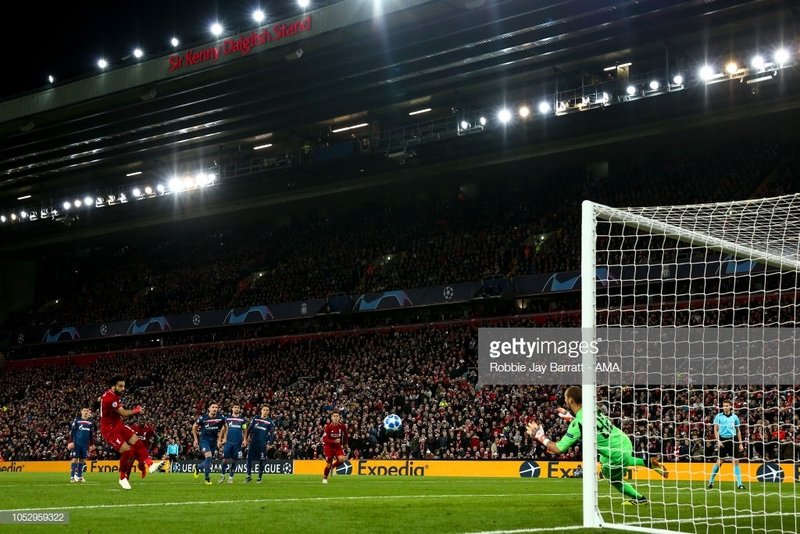 The hosts' build-up play has been really impressive this evening, whether that is down to an open Red Star defence that has played into Liverpool's hands or simply the sharp movement that Salah and Co. have exhibited, it has been a joy to watch. Robertson goes off to a well earned ovation, Moreno comes on for him to make his season debut in the competition. Liverpool are taring Red Star apart now. There are huge spaces developing amongst the serbian defence. Lallana was released and through on goal, but received a slight nudge from Stojkovic and can only pass towards the outrushing goalkeeper. He does get his goal! Wijnaldum nudges the ball to Sturridge on the edge of the Red Star area, he - with his back to goal - plays the ball towards Mane who pushes it past Borjan and into the net. Mane prepares to take the penalty, he hits it to the right but the goalkeeper manages to push the ball onto the bar. It bounces down and out. No goal for Mane, yet. Causic is on for Jovicic. Jovicic slides in on Robertson close to the far touchline, referee gives the foul; free-kick to Liverpool. Alexander-Arnold whips it into the area and Stojkovic handles the ball. Another penalty to Liverpool. Sturridge is on in the place of Salah. Red Star break again this time through the centre. Ben Nabouhane is released by a through ball but Gomez comes across with a perfectly timed tackle to deal with the momentary threat. Red Star unlucky not to manage their first chance on target; the ball is sent low into the box but Ben Nabouhane cannot quite reach it as he slides in front of Alisson. Shaqiri makes way for Lallana. Liverpool have got a corner kick on the left side, Alexander-Arnold to take it - once some shoving has been dealt with by the referee. Van Dijk jumps to meet the in-swinging ball but it appears like he is being pulled back, anyhow nothing come of it. Red star simply cannot get beyond the Liverpool midfield - Fabinho in particular is covering the centre very efficiently. Firmino has a shot from outside the area and it forces Borjan into a diving punch to his left. Salah almost through on goal again. Firmino plays it onto his fellow attacker but Salah is unable to get past Babic. Liverpool are not allowing the opponents any time on the ball, the Reds' press is vicious - we haven't seen this for a little while. ...and that could have been a fourth. Alexander-Arnold manages to manoeuvre himself into a position to strike a floating ball over the top, but it was not hit with any force. Krsticic commits a foul to the right of the penalty area 'D'; Shaqiri's shot is blocked by the wall. Salah strikes the spot-kick straight down the middle with some force. That's 3-0 and Liverpool have this game more or less boxed off with that. Penalty for Liverpool! The goal-line assistant has awarded it after Red Star captain Stojkovic elbowed Mane when he was baring down on goal. Salah will step up to take it in front of the Kop. Fabinho swipes a shot from outside the Red star area but it was always rising. Liverpool have started on the front-foot in the early stages of the second half, not allowing Red Star to settle or gain any momentum. Liverpool are in charge of this match, and have barely gone above third gear. Klopp might be inclined to make some early changes just to keep everyone fresh with a busy period coming up. We are back underway at Anfield. That was a first half performance that Liverpool can be proud of; there was more aggression and pace to their attacks than what they have shown in recent weeks. The intricate play amongst the attackers was high quality and the second goal was an example of that. Red Star have certainly not sat back, they have pushed forward when possible, but they have caused little, if any, threat to Alisson's goal. The goal just before the break will affect the visitors and Milosevic's half time team talk. Right I'm off for a hot drink... oh wait, the power's out in the Main Stand so maybe just water will have to do. Speak to you in 15. The referee blows his whistle and that brings the first half to a close. There will be two minutes of stoppage time. Wijnaldum plays a delicate ball into Shaqiri who produces a lovely deft lay off to Salah. The Egyptian steadies himself then fires the ball past Borjan. It was coming. Robertson has made a mistake, this is not a drill!! He slices a shot inside the Red Star area. Just before that Stojkovic went in heavy on Mane, the German referee waved play on and didn't even go back to award a yellow card - his first boo-boo of the evening too. Shaqiri and Alexander-Arnold are standing over a free kick about 20 yards out from goal, given for a foul by Babic. Shaqiri send the ball over the Red Star defence but it skids of the turf and into the gloves of Borjan. A flying Borjan soars into the Merseyside sky. Shaqiri's shot-come-cross was a rather easy collection for the goalkeeper but that was certainly a claim for the cameras. In that vivid green strip, some might have been fouled into thinking there was an exotic bird in Anfield. Good play once again from Liverpool. Robertson wins the ball back , plays a one-two with Firmino but then fires the ball from a tight angle over the bar. The hosts are playing with verve, it looks ominous for Serbians. Linesman's flag goes up just as Salah approaches the goalkeeper to shoot, it was the right call if not a little late. Krsticic of Red Star almost plays through Ben Nabouhane but the through ball has a little bit too much on it. Red Star are experiencing more sustained possession at the moment. All of their players appear comfortable on the ball and are moving it swiftly and precisely. Gomez and Van Dijk are currently dealing very well with Boakye who is struggling to get a touch of the ball. Liverpool's attacking play is increasingly coming down this near left side, and Robertson is the driving force. Stojkovic needs his fellow right sided players back to support him. Salah almost manages to reach a slightly overhit cross from the Scot but the ball runs out of play. Another chance for Liverpool. Robertson is involved again on the left, he feeds Mane who in turn plays the ball to Salah on the edge of the area. The Egyptian, however, scuffs his shot and lets Red Star of the hook. Liverpool are almost in again, but this time the danger is snuffed out by Red Star's backline. Red Star are stilling willing to commit players, they certainly are not sitting back in this affair. And as if by magic... nice build up play from Liverpool, Shaqiri releases Robertson down the left side and he pulls the ball back to Firmino who has time and space to fire past Borjan and give Liverpool the lead. Intricate play into Salah's feet just inside the visitor's penalty area, but Stojkovic arrives just in time to clear the ball from danger. There are signs that Liverpool are starting to get more comfortable now. Red star win a corner, to the dismay of the Kop, Stojkovic did well. Degenek, up from defence, finds the ball at his feat from the corner but cannot capitalise on the space he has and the balls fires of his shin over the crossbar. Liverpool are playing very fluidly, Shaqiri is often moving inside to play slightly deeper. The key for the hosts is to try and keep the ball on the ground, there's no point in trying to play high balls towards Red Star's two big centre-halfs. Firmino sees a shot from the left side of the Red Star area blocked by Alexander-Arnold, the ball goes out for a corner. In the preceding play, Salah brings the ball down with fantastic technique after cleverly keeping onside, he side-stepped the goalkeeper but Borjan manages to claim the ball. The Red Star keeper stayed down momentarily but is ok to continue. Both sides are giving the ball away a little too easily in these early stages, slightly scrappy start to the match. Red Star have been more aggressive and attack-minded in the first 10 minutes than were expected, they are looking to play the ball forward, but that in turn is inviting Liverpool to play into the gaps left by behind the midfield. From initial viewing it appears that Liverpool are playing in a 4-2-3-1 formation with Firmino, Mane and Shaqiri playing just behind Salah. Red Star win themselves a free kick on this near side, Ebecilio takes it and whips a very inviting cross into the Liverpool area, but the Reds defence deals with it relatively easily. Jovicic goes in hard on Firmino just inside the visitors' half, free kick to Liverpool who opt to play it short. Red Star are trying to build from the back, it will be interesting to see if Liverpool try and press more aggressively than they did against Huddersfield on Saturday. Red Star get us underway, they are wearing a pastel blue coloured kit and are attacking from left to right. A Champions League newcomer, German referee Daniel Siebert, leads the teams out. All seats are taken. Here we go! Both sets of players are currently finishing off their warms ups on the Anfield turf. Jurgen Klopp is spending just as much time - if not more - watching the Red Star players being put through their paces than he is watching his own. A reminder that there will be no Belgrade fans inside the ground tonight as they are serving a Uefa punishment dished out because of issues during their play-off victory away in Salzburg. On the pitch Red Star are likely to setup in a 4-2-3-1 formation with striker Richmond Boakye leading the line. Whereas Liverpool will be in their custom 4-3-3 with their traditional leading line of Mane, Salah and Firmino but with a new-look midfield featuring Fabinho and Shaqiri - it will be interesting to see how Fabinho, in particular, fairs this evening. Kickoff is just under 15 minutes away now. Hello and welcome to Anfield for this evening's Champions League match between Liverpool and Red Star Belgrade. I am your reporter for the evening Oliver Miller and I will be providing updates throughout the game. Red Star Belgrade XI: Borjan, Stojkovic, Babic, Degenek, Gobeljic, Krsticic, Ben Nabouhane, Ebecilio, Srnic, Boakye. Subs: Popovic, Pavlov, Stoiljkovic, Causic, Simic, Jovancic, Savic. That's all the build up for now - join us from around an hour before kick-off for confirmed teams. VAVEL UK's preview for this match can be found here. How have Red Star faired so far this season? The Belgrade club were beaten 6-1 at Paris in their second fixture, equalling their biggest margin of defeat in European competition. Their first game in the UEFA Champions League proper ended in a goalless draw at home to Napoli. Despite that defeat, Red Star have lost only three of their last 19 European games (W7 D9). They have drawn two of their four European away games this season, and have lost only two of their last nine (W3 D4) – in Paris and 1-0 at CSKA Moskva in last season's UEFA Europa League round of 32 second leg to lose by the same aggregate scoreline. They had conceded only four goals in that run before shipping six on matchday two. Champions of Serbia in 2017/18, when they reached the UEFA Europa League round of 32, Red Star came through four qualifying rounds to reach the group stage – the first time they had successfully negotiated the UEFA Champions League preliminaries at the seventh attempt. They kicked off this season in the first qualifying round, where they got the better of Latvia's Spartaks Jūrmala 2-0 on aggregate. Lithuania's Sūduva were beaten 5-0 over two legs in the second qualifying round, before extra time secured a 2-1 away win at Slovakia's Spartak Trnava in the third qualifying round second leg to complete a 3-2 aggregate victory. They came from 2-0 down to draw at Salzburg in the play-off second leg, going through on away goals after a 2-2 aggregate draw. The only past contests between the sides – and Liverpool's only experience of Serbian opposition – came in the second round of the 1973/74 European Cup, Red Star winning both legs 2-1 to reach the quarter-finals, where they would lose to Atlético Madrid. The Anfield result was Liverpool's first home loss in UEFA competition; the second did not follow for another 18 years. The first leg of the Red Star-Liverpool tie, in Belgrade, was played on 24 October 1973 – 45 years to the day before this game. On Tuesday afternoon Jurgen Klopp and Trent Alexander-Arnold addressed the media ahead of the match. "They are the dominant side in Serbia, winning 80-90% in their league, but the Champions League is different. They did well against Napoli; against PSG, if Neymar starts scoring then nobody can defend that. It's all about how they are able to defend and create chances and I know they can do that. They are tall and quick, and their full-backs really have legs; they are quick and offensive oriented. We have to be prepared to fight for every square metre of the pitch. "I played in empty stadiums before. Not because people were banned but because they were not interested." "We want to be challenging for both the Premier League and Champions League. There's still a lot to come - better performances is something we're striving for. It takes a little bit of time to get used to the Champions League but now I feel used to it. It's one of the biggest competitions in the world, and something I feel ready for. All teams in this competition are not just taking part - 'Red Star' have already shown they’re not scared of potentially bigger clubs." Red Star coach Vladan Milojevic named a 21-man travelling squad for the match, with attacking midfielder Marko Marin a notable absentee due to injury. Left-back Milan Rodic and forward Jonathan Cafu are also unavailable, while central defender Vujadin Savic made the trip but is a fitness doubt. There are some injury doubts for Liverpool heading into this match but Sadio Mane could feature after having surgery on a hand injury. Mane missed his side's Premier League victory at Huddersfield on Saturday after sustaining the injury whilst away with Senegal on international duty. Reds boss Klopp however, has confirmed that Naby Keita and captain Jordan Henderson will not play against Red Star on Wednesday. Henderson has a hamstring injury and will also miss Saturday's match against Cardiff. Having lost late on away in Naples on match day two, Jurgen Klopp is aiming for Liverpool to return to winning ways with the visit of the Serbian champions. Red Star are bottom of the group with one point from two games and were banned from selling tickets to supporters for this match at Anfield after incidents during and after their team's play-off round tie away to RB Salzburg in late August. These back-to-back matches against Red Star will be crucial to Liverpool's hopes of progression from the group stage; with Napoli and Paris Saint-Germain facing off over the next two match days, there is an opportunity for the Reds to take control of this group. Hello and welcome to VAVEL UK's live text coverage of the Champions League match between Liverpool and Red Star Belgrade from Anfield. I'm Oliver Miller and I'll be keeping you updated with the latest live from inside the stadium as Jurgen Klopp's side aim to bounce back from defeat away to Napoli last time out. It is an 8.00pm kick-off on Wednesday and you can bookmark this page to stay up to date with the latest updates and team news as the match approaches.